Salt (sodium) is essential to our bodies. Normally the kidneys control the level of salt. If there is too much salt, the kidneys pass it into the urine. But when our salt intake levels are very high, the kidneys cannot keep up and the salt ends up in our bloodstream. Salt attracts water. When there is too much salt in the blood, the salt draws more water into the blood. More water increases the volume of blood which raises blood pressure. Blood pressure refers to the amount of pressure on the walls of your arteries. Think of a garden hose. When the water is off, there is no pressure on the walls of the hose. When the water is on halfway, there is some pressure on the walls of the hose. When the water is on full the way, there is more pressure on the walls of the hose. Your body controls the pressure in your arteries using a complex system of regulators including your heart, kidneys, enzymes, hormones and your nervous system. Blood pressure is always changing based on your activity level, stress level, time of day, and even the position of your body. Lifestyle factors such as alcohol, caffeine, food, tobacco (smoking), and stress can all change your blood pressure. There are several categories of high blood pressure: normal, pre-high blood pressure, stage 1 high blood pressure, and stage 2 high blood pressure. If either of the numbers in your blood pressure measurement is higher than normal, you should work on reducing your blood pressure through lifestyle changes and should seek the care of a physician. Some people are more sensitive to salt than others. In some people, too much salt will cause their blood pressures to rise, in others there will not be as large a change. About half of people are salt sensitive. 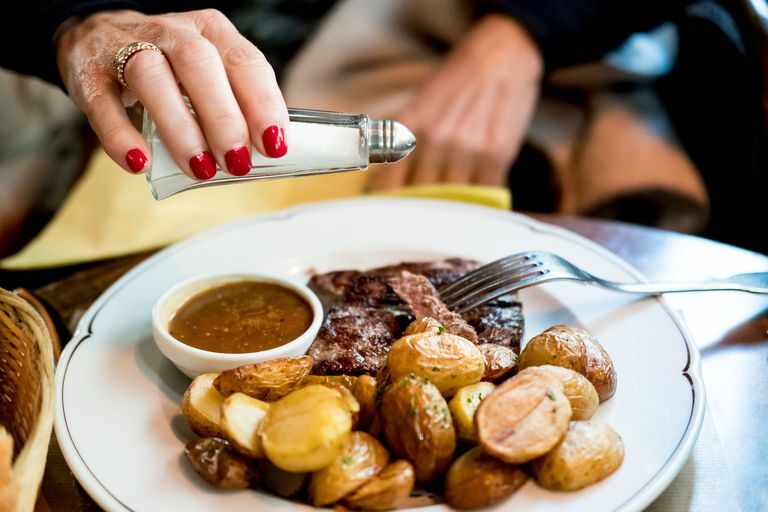 African-Americans, the elderly, and people with diabetes are more often salt sensitive. If you have high blood pressure, you can always benefit from decreasing your salt intake. You need about 500 milligrams of salt every day for your body to function. Most people take in about 10 times that amount daily. The recommended amount of salt for people with high blood pressure is about 1500 milligrams a day. Any reduction in your salt intake will help. Processed foods use salt as an additive. Almost 80% of the average person's daily salt intake comes from processed foods. If we ate only natural foods and limited the use of table salt, we would be able to eliminate excess salt in our diets. Salt can hide in many processed foods. Try to eat mostly produce, fruits and fresh meat. Avoid condiments, pickles, ham, bacon, salsa, cheese, cold cuts, olives, broths, anything canned, and anything processed. The list can go on and on. You need to check the sodium content on food labels and think twice about anything with over 100 mg per serving. A few of these items are okay every day, but not too many.